Map of the Week for previous years highlighting noteworthy work in public health and Geography. This map shows percentage of Infants that are exclusively breastfed for the first six months of life. The World Health Organization (WHO) and the American Academy of Pediatrics (AAP) emphasize the value of breastfeeding for mothers as well as children. Both recommend exclusive breastfeeding for the first six months of life and then supplemented breastfeeding for at least one year and up to two years or more. Unlike most things that sound too good to be true, the list of benefits from breastfeeding is so long (and growing) that this practice could qualify as a bonafide magic bullet for health and wellness. Whether in a poor or rich country, studies show breastfeeding significantly reduces the risk in infants for respiratory tract infections, diarrhea, asthma, allergies, childhood leukemia, many other infectious diseases and, over the course of a lifetime, Type 1 diabetes or obesity. According to the World Health Organization, breastfeeding is the best form of nutrition for infants during the first 6 months of life. The American Academy of Pediatrics notes that breastfeeding is also beneficial for mothers as it lowers their risk of breast and ovarian cancers, lessens postpartum bleeding and even helps them lose the extra weight acquired during pregnancy faster. Working in over 50 countries, PEPFAR has transformed the global HIV/AIDS response. PEPFAR supports more than 14 million people with lifesaving antiretroviral treatment. This is compared with the only 50,000 people who were on treatment in sub-Saharan Africa when PEPFAR began. The National Association of County Health Officials was founded in 1965. In early 1984, the organization experienced remarkable growth in membership and the organization opened its own office. In 1994, it was renamed to National Association of County and City Health Officials (NACCHO). THE MALARIA ATLAS PROJECT AIMS TO DISSEMINATE FREE, ACCURATE AND UP-TO-DATE GEOGRAPHICAL INFORMATION ON MALARIA AND ASSOCIATED TOPICS. The Malaria Atlas Project (MAP) brings together a global network of researchers with expertise in a wide range of disciplines, from public health to mathematics, geography, and epidemiology. We work together to assemble global databases on malaria risk and intervention coverage and develop innovative analysis methods that use those data to address critical questions. These include better understanding the global landscape of malaria risk, how this is changing, and the impact of malaria interventions. By evaluating burden, trends, and impact at fine geographical scale we support informed decision making for malaria control at international, regional and national scales. As part of this mission, MAP obtains, curates, and shares a wide variety of malariometric data. These include malaria cases reported by surveillance systems, nationally representative cross-sectional surveys of parasite rate, and satellite imagery capturing global environmental conditions that influence malaria transmission. The MAP group provides the outputs of our research, as well as broader technical advice and support, to National Malaria Control Programmes (NMCPs), non-governmental organisations (NGOs), Ministries of Health, and other third parties as part of our commitment to open access data. MAP is led by Professor Peter Gething of The Big Data Institute at The University of Oxford. The MAP group comprises research staff conducting academic work and technical staff who deal with obtaining, curating, and disseminating data and providing mapping support to NGOs and NMCPs. MAP is a World Health Organization (@WHO) Collaborating Centre. MAP collaborates with WHO on the estimation of malaria programme coverage and disease burden and projecting changes in malaria risk to 2040. 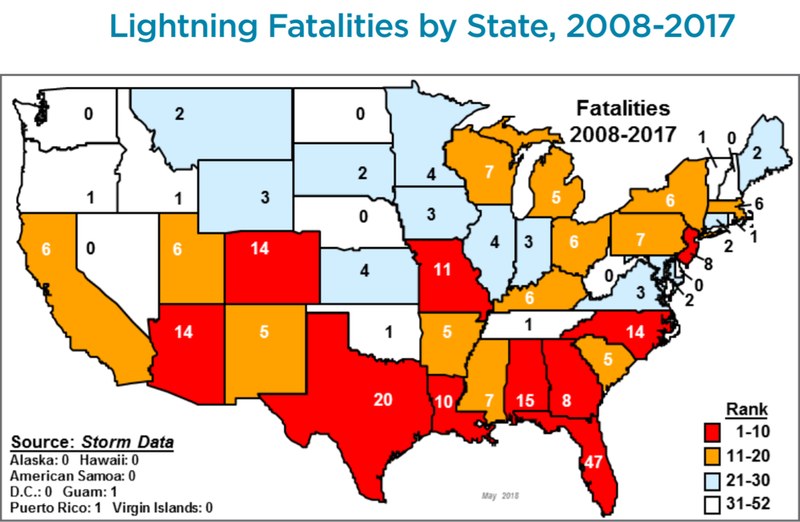 From 2006 through 2017, 376 people were struck and killed by lightning in the United States. Almost two thirds of the deaths occurred to people who had been enjoying outdoor leisure activities. The common belief that golfers are responsible for the greatest number of lightning deaths was shown to be a myth. During this 12-year period fishermen accounted for more than three times as many fatalities as golfers, while beach activities and camping each accounted for about twice as many deaths as golf. From 2006 to 2017, there were a total of 34 fishing deaths, 22 beach deaths, 19 camping deaths, and 17 boating deaths. Of the sports activities, soccer saw the greatest number of deaths with 12, as compared to golf with 10. Around the home, yard work (including mowing the lawn) accounted for 14 fatalities. For work-related activities, ranching/farming topped the list with 17 deaths. Data: United Nations World Population Prospects Database & Piel, F. B. et al. Global epidemiology of sickle haemoglobin in neonates: a contemporary geostatistical model-based map and population estimates. Lancet 381, 142–151 (2013). Sickle cell disease (SCD) is a group of inherited disorders caused by mutations in HBB, which encodes haemoglobin subunit β. The incidence is estimated to be between 300,000 and 400,000 neonates globally each year, the majority in sub-Saharan Africa. Haemoglobin molecules that include mutant sickle β-globin subunits can polymerize; erythrocytes that contain mostly haemoglobin polymers assume a sickled form and are prone to haemolysis. Other pathophysiological mechanisms that contribute to the SCD phenotype are vaso-occlusion and activation of the immune system. SCD is characterized by a remarkable phenotypic complexity. Common acute complications are acute pain events, acute chest syndrome and stroke; chronic complications (including chronic kidney disease) can damage all organs. Hydroxycarbamide, blood transfusions and haematopoietic stem cell transplantation can reduce the severity of the disease. Early diagnosis is crucial to improve survival, and universal newborn screening programmes have been implemented in some countries but are challenging in low-income, high-burden settings. HealthMap brings together disparate data sources, including online news aggregators, eyewitness reports, expert-curated discussions and validated official reports, to achieve a unified and comprehensive view of the current global state of infectious diseases and their effect on human and animal health. Through an automated process, updating 24/7/365, the system monitors, organizes, integrates, filters, visualizes and disseminates online information about emerging diseases in nine languages, facilitating early detection of global public health threats. Click on the button below to download their brochure and learn more. Map & Data: NOAA National Centers for Environmental Information, State of the Climate: Global Climate Report for April 2018, published online May 2018, retrieved on May 17, 2018 from https://www.ncdc.noaa.gov/sotc/global/201804. While North America had its coldest April since 2013, the rest of the world was downright balmy. Record and near-record-warm temperatures were felt across Europe and from Argentina to Australia, making it the third hottest April on record globally. Search, browse and select cities on an interactive map to see local allergy and pollen forecasts. Where are pollen counts high today? Also, see the 5 best and worst cities in the United States for allergy sufferers. Real-time map of Air Pollution worldwide. Hourly, daily, and monthly views with locations of air quality monitoring stations. This animated time-series map by @WHO features worldwide coverage of dtp1 (diphtheria toxoid, tetanus toxoid, and pertussis vaccine) as well as the unvaccinated population by country from 2000 - 2016. Watch the New York Daily News Interactive (@NYDNi) map-timeline of 2018 school shootings, or filter shootings by the state the shooting happened in, or by casualties. Between 1980 and 2014, there were 2 848 768 deaths due to substance use disorders and intentional injuries recorded in the United States. Mortality rates from alcohol use disorders (n = 256 432), drug use disorders (n = 542 501), self-harm (n = 1 289 086), and interpersonal violence (n = 760 749) varied widely among counties. Mortality rates decreased for alcohol use disorders, self-harm, and interpersonal violence at the national level between 1980 and 2014; however, over the same period, the percentage of counties in which mortality rates increased for these causes was 65.4% for alcohol use disorders, 74.6% for self-harm, and 6.6% for interpersonal violence. Mortality rates from drug use disorders increased nationally and in every county between 1980 and 2014, but the relative increase varied from 8.2% to 8369.7%. Relative and absolute geographic inequalities in mortality, as measured by comparing the 90th and 10th percentile among counties, decreased for alcohol use disorders and interpersonal violence but increased substantially for drug use disorders and self-harm between 1980 and 2014.